Click here for the list of major award winners from the 2017 World Show. The 2017 World Taxidermy & Fish Carving Championships® is shaping up to be our biggest show ever. Registrations are as affordable as any we have ever offered and our facility and hotel are the best we have ever offered. There are several new changes to the rules and schedule from previous years. Trade Show for Taxidermists. If you want to visit and see the largest industry trade show in the world for taxidermists, you are coming to the right place. The trade show offers 61 different vendors in 161 booths. There you will see everything this industry has to offer. Vendors offering the newest taxidermy forms, glass eyes, products, tools, fur dressers, tanneries, and just about every associated vendor for taxidermists will be there. Over $46,000 in Cash and Awards. Taxidermists will be competing for $33,000 in cash awards and carvers for over $3,000. If you want to compete for the largest cash awards at the World Championships®, you should go after the Competitors’ Award, where $20,000 in cash will be awarded. You are automatically eligible if you enter four entries in either the Professional or Master Division. If you have four entries in both divisions, you must specify in which division you wish to compete for the Competitors’ Award. Please read the complete rules for this special award in our rules here. Competition Levels for Everyone. There is a division of competition for every level of skill, and when you enter you will have the opportunity to be critiqued by the most talented and experienced taxidermists in their fields. You do not have to compete to be a part of this great show, but it sure brings on a sense of pride to tell everyone you did! Lifetime Achievement Award. It is also our pleasure to announce that the fifth World Show Lifetime Achievement Award will be presented to taxidermist, instructor, and sculptor Joe Meder of Solon, Iowa. Joe’s contributions to the taxidermy industry are many and far-reaching. Our award presentation will highlight his story. World Show Awards Banquet. We have a very entertaining program planned to honor Joe at the 2017 Awards Presentations Friday night. We have a limited seating of 600 for this dinner and award ceremony and it sells out at every show. We recommend booking your banquet tickets when you register. Be there to witness $36,000 in cash awarded to winning taxidermists and fish carvers from all over the world! At the World Show Awards Presentations not only are all the cash awards given out and winners of World Titles named, but special talents from our industry will entertain you along with video clips from movies and TV, all using taxidermy as a main theme. We are very happy to announce the return of Russell Knight as our Master of Ceremonies for the 2017 award program. Russell is the star of the History Channel series “Mounted in Alaska,” and his quick wit and savvy will make for a very entertaining evening. Best All Around Competition for 2017. The new Best All-Around Taxidermist award returns for the third time at this show. The Master division winner will receive $2,000 and the Professional winner will receive $1,000. Ohio Taxidermy Supply is generously donating the money for this award. All of the information and details for competing for this award have been added to our rules. No one ever forgets his first World Show! Make plans now to be a part of the biggest and brightest taxidermy and fish carving event in the world! Join thousands of your peers for five days of educational and inspirational fellowship that will change the way you look at our profession. Record-numbers of taxidermists and fish carvers are already making travel plans to attend the 2017 World Taxidermy and Fish Carving Championships®. Past World Shows have attracted registrants from all 50 states and 22 nations! Whether you’re new to the taxidermy industry or a seasoned pro, The 2017 World Shows offers valuable educational and networking opportunities for all taxidermy levels. The 2017 World Taxidermy & Fish Carving Championships® is shaping up to be one of our biggest shows ever. Registration fees have been reduced to 2009 prices, and gasoline prices are headed lower than they’ve been in quite a while. With two-thirds of the nation’s taxidermists located within a one-day drive of the facility, this is the one show that you don’t want to miss! Over twenty seminars by leading industry experts, which will cover every facet of taxidermy and fish carving. We have a world-class line up of instructors, including many World Champions. The world’s largest taxidermy and fish carving competitions. At past World Shows there have been over 700 entries. It’s great fun if you enter, but if you don’t, just viewing it is an experience you will long remember. Twenty-two of the most experienced and highly recognized judges in the industry will officiate the competition. There is a division of competition for every level of skill, and when you enter you will have the opportunity to be critiqued by the most talented and experienced taxidermists in their fields. You do not have to compete to be a part of this great show, but it sure brings on a sense of pride to tell everyone you did! If you want to visit and see the largest industry trade show in the world for taxidermists, you are coming to the right place. A huge exhibit hall featuring the top suppliers of taxidermy services, technology and supplies featuring 165 trade show booths. You will be able to see firsthand new products and purchase the newest forms and innovations being offered by these companies. Many of these companies will offer great discounts at this show, plus the shipping costs are eliminated. There is no better opportunity to see it all at one location. Vendors offering the newest taxidermy forms, glass eyes, products, tools, fur dressers, tanneries, and just about every associated vendor for taxidermists will be represented. The climax of the event is the 2017 World Show Awards Banquet, where over $46,000.00 in cash and awards will be won. Those competing for the Competitors’ Awards alone will be winning a record amount of $20,000.00! We have a limited seating of 600 for this dinner and award ceremony and it sells out every show. We recommend booking your banquet tickets when you register. THE PEORIA MARRIOTT PERE MARQUETTE HOTEL and the Marriott Courtyard are the host hotels for the 2017 World Taxidermy and Fish Carving Championships®. The Pere Marquette is an historic, elegant hotel and the entire interior is newly renovated to the high standards of the Marriott Corp. The Marriott Courtyard is brand new with spacious rooms that are well appointed with a refrigerator and large windows overlooking the city of Peoria. Both hotels have offered our group free WiFi, free self-parking, and two free vouchers per room to a morning buffet breakfast at the Pere Marquette. The buffet will be in a separate location from the hotel restaurant and available to our room block only. Vouchers will be given at check-in with the location for the breakfast buffet. 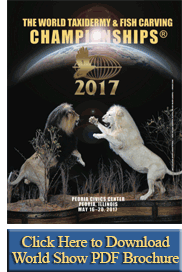 The beautiful and spacious Peoria Civics Center will be the location for the World Show competitions, trade show exhibition, seminars, and Awards Banquet. We are very excited about this new location and venue and feel it is a perfect fit for our event. 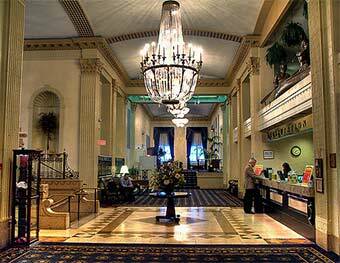 Both hotels are located in the heart of downtown Peoria and offer plenty of on-location parking. The Peoria Civic Center, located behind and one block from the two hotels, has plenty of additional parking for large trucks and trailers. The event site is a 6.5-mile drive from General Wayne A. 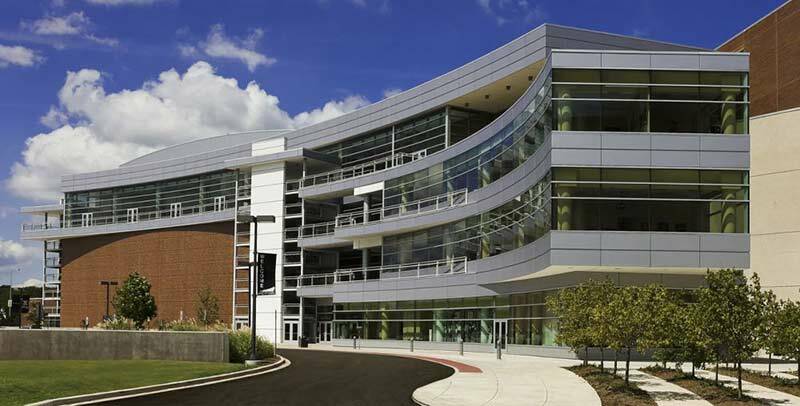 Downing Peoria International Airport, and the hotels are also an 11-minute walk from the Peoria Riverfront Museum. The property offers a lounge bar and bistro serving Starbucks coffee and a high-end American restaurant, as well as an indoor pool, whirlpool tub, and 24-hour fitness center. There’s also a business center, laundry facilities, and free parking. The Peoria, Illinois area is easy to get to, with over two-thirds of the nation’s taxidermists living within a one-day’s drive. We feel the venue is a perfect fit for the greatest taxidermy and fish carving exhibition on earth. Ride the wave of emotion and excitement of watching the world’s best taxidermists and carvers compete for the coveted Best in World Titles! Probably one of the greatest things about attending a World Show are the people you’ll meet who’ll become your friends—not just the judges, seminar instructors, vendors, and World Show personnel, but people like you who attend to enjoy and experience the largest venue in the world for taxidermists and carvers. There is a common bond at this show with no politics, and you will experience one of the most enriching times of your life. 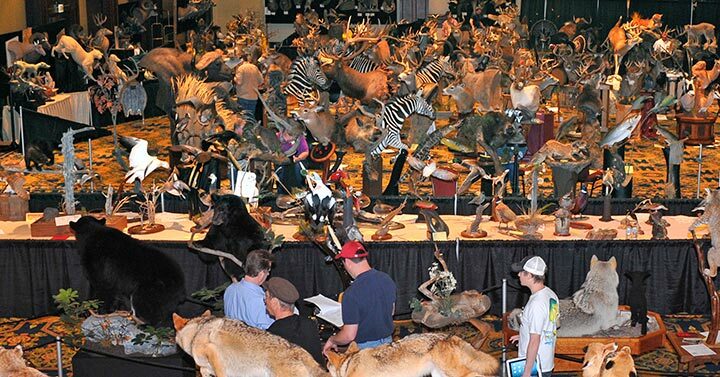 We have been told over and over that the World Show is the greatest event a taxidermist will ever be a part of, and we will always do our utmost to keep it that way. It is time to start planning the event of your lifetime—we hope to see you there!